Stelatel is a trusted name in cabling and TV point installation in and around Melbourne. With more than 10 years in the industry, Stelatel has a strong reputation for delivering reliable and affordable TV point and cabling solutions to all our customers. Our trained technicians strive to provide an unmatched service for residential, commercial or industrial installations and fittings. 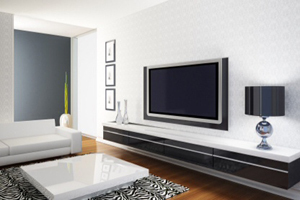 Data or television point installation is an important part of outfitting any home, and ranges from simple TV point installations to elaborate home theatre systems. These systems require professional installations and servicing; whatever your electrical and data cabling requirements, be sure to contact a reliable and recognised name. As a government-backed company, all of Stelatel’s technicians are ACMA-accredited registered cablers. This ensures the highest level of skills and experience, allowing the best possible TV point installation in Melbourne. You can trust Stelatel to provide high quality data cabling installations in and around Melbourne, at affordable prices and flexible hours. Contact us now for more information or for an obligation-free quote. – Ease of connectability to all available services. – And with our extensive knowledge in this area, specialising in NBN, we can provide sound advice on how best to wire the home to future proof all of your communication requirements. Stelatel offer a NBN Pre-installation services to residential builders across Melbourne. As the NBN footprint expands across Victoria more and more homes can be NBN Ready from day one of occupancy. Our experienced team manage the entire process with NBN from lodging your property with NBN to completing the install. More and more new developments are now set up with fibre in the street, our job is to connect the network from pits in the street into the home. This process is completed by fitting a Premises Connection Device (PCD) to the external wall, usually near the meter box, then an internal cable is run from the PCD into the garage where the Internal Home Distributor is located. This service is fully paid for by NBN (including all materials), with no charge to you, and will ensure that all un-slightly pipes are fitted off prior to properties being handed over to your clients. Builders we are currently working with are delighted with the service as their properties are fitted off during the building stage and supervisors are not left trying to explain the conduit and string hanging at the side of a property they are handing over. From a Customer perspective, they simply need to choose a provider and activate over the phone. No need to book an appointment with NBN and take a day off to be home for the work to be completed – they are NBN ready from day 1 of occupancy. From experience we notice that many Lead In Conduits are damaged after being dug-in as heavy machinery travel over the pipes and other trades complete their work. This can cause significant issues when a Client attempts to connect to NBN as landscaping and driveways have generally been completed. By Stelatel completing the installation prior to handover we can help minimize the impact of such damages, should they occur, leaving your Clients to settle into their new home without additional stress. Ensure your Melbourne property is NBN Ready with Stelatel Communications! As NBN (National Broadband Network) is rolled out across Melbourne it is vital to ensure you prepare your property for High speed internet. NBN uses fibre optic cabling which is vastly different to the current cabling used in Australia. If you are building a new property or looking to upgrade we can ensure you are NBN ready with minimal fuss when NBN is rolled out in your area. Our Domestic/Residential NBN package will ensure you have the ability to take advantage of superfast download speeds to chat, download or stream in an instance. If you are a business you will know the benefits of being able to do things quicker. Our Business/Commercial NBN Package will ensure you are taking advantage of the highest available internet speeds in Melbourne. Our experience technicians will ensure all ports and internal cabling are optimized to get the most out of the NBN rollout.